One of the most popular printer brands on the market, Canon has long been a trusted name in photography. Using its specialist print know-how, it’s created a range of affordable and reliable printers that not only produce stunning photo prints, but also crisp and sharp monochrome and full colour documents. At home or in the office, Canon printers provide the level of quality printing you need. From official documents to full-colour glossy prints and brochures, there’s a Canon printer to match. Available in a range of sizes to suit any space, you can free your workspace of cables by choosing a wireless model too. 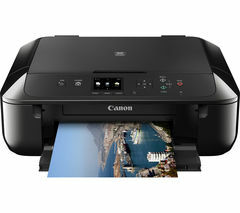 Save even more space with an all-in-one printer that also scans and faxes, or choose from our dedicated Canon photo printers for lab-quality photos at home. 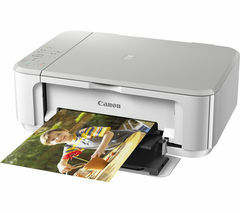 Wireless Canon printers sync up via WiFi with Apple AirPrint and Google Cloud Print to enable you to print off high quality prints from your smartphone, tablet, laptop or any other internet connected device. There’s no need to transfer your files first, so you’ll save time and hassle. You’re always guaranteed stunning results with printer resolutions up to an incredible 9600 x 2400 dpi. From dedicated photo printers to all-in-one wireless inkjets, whatever your printing needs, we have a Canon printer that’s perfect for you. For a wider selection of printer options, check out our popular Brother printers range too.